Professor Barker: 'In Beyond the Pleasure Principle, Freud takes a number of crucial initial steps towards mapping the Geocosmic Unconscious as a traumatic megasystem, with life and thought dynamically quantized in terms of anorganic tension, elasticity, or machinic plexion. This requires the anorganizational-materialist retuning of an entire vocabulary: trauma, unconscious, drive, association, (screen-) memory, condensation, regression, displacement, complex, repression, disavowal (e.g. the un- prefix), identity, and person. Watching Quatermass and the Pit again last week - Nigel Kneale's masterpiece, and undoubtedly the best film Hammer ever released - I started to think, again, about memory, trauma and the organism. The film is about an excavation in the fictional London tube station of Hobbs End. Workers uncover what turns out to be a Martian spaceship, filled with the corpses of repulsive quasi-insect beings. Aliens, we think... Yet the genius of Kneale's script is that the Martians turn out not to be aliens at all. Fleeing the destruction of their own planet, the Martians had, five millions years previously, interbred with protohuman hominids in order to perpetuate their species. So the distinction between alien and human is fatally unsettled. As the Quatermass sequence progresses, the alien has become increasingly intimate: The Quatermass Xperiment - the aliens are out in space; Quatermass II - the aliens are already amongst us; Quatermass and the Pit - we are the aliens. 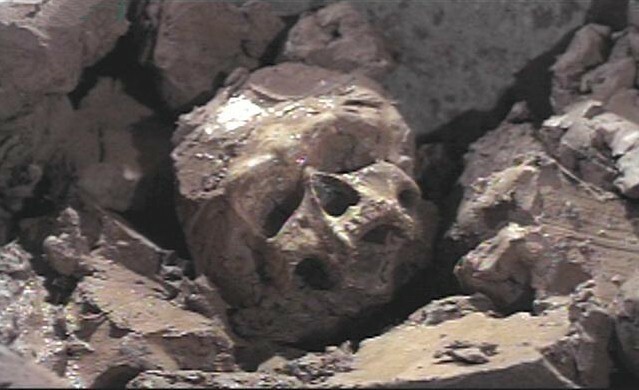 A darker version of the origin of humanity story told in the near-contemporaneous 2001*, Quatermass and the Pit also shares much with Ballard's The Drowned World: most importantly the theme of what Marcus calls 'phylogenetic memory'. As I understand it - and I'm really, really keen for someone who knows about science to set me right here (Geeta???) - there is no scientific basis for this notion of 'phylogenetic memory'. Genes are a ROM transmission system; the legacy that you will pass on to your offspring is already determined before your birth (unless you are subject to mutation). Experiences, learning - culture - cannot be directly passed on; such lessons have to be learned anew by each generation. What then of instincts? How do they fit in? Are instincts a kind of memory? With Quatermass and the Pit, the memory is a 'literal' memory, a deeply submerged but still accessible mental trace (triggered, in the film, by the unearthing of the spaceship); with The Drowned World, the 'memories' are encoded in they physical form of the human being itself, Ballard's famous 'spinal landscapes.' Quatermass and the Pit is archaeological; The Drowned World, geological. Anticipating Deleuze and Guattari's 'geology of morals' Ballard's innovation lay in collapsing culture, psychology and biology into geology. Should we refer to Ballard's 'spinal landscapes' as memories at all, or as trauma records? Trauma is anti-memory, non-organic memory, what the organism cannot assimilate but which - according to Freud - makes possible organic life as such. In non-organic systems, there is no distinction between what is remembered and that which remembers; there is no unalterable 'Judgements of God' ROM, just as there is no so 'recording' system that can't itself be 'recorded over'. *Although the Quatermass and the Pit story was, by then, over a decade old. It had been filmed by the BBC back in 1956. Great post Mark. I'm certainly no scientist, but I *think* the idea of phylogenetic memory is Lamarckian, ie it relies on the transmission of acquired characteristics, the idea that your DNA can change over the course of your life and you can pass on this altered code to your offspring, as opposed to the Darwinian natural selection model. Instincts *behave as if* they were a kind of species-memory (this idea seems the obvious explanation of them, as of so many other things, hence the erstwhile popularity of Lamarckism) but they're actually just random mutations that happen to have been adaptive. That's probably all crap though. Please, scientists, tell me why I'm wrong, it's the only way I'll learn! Ha, yes, so I hear. I'm warming to the latest Aussie BB too. I've only seen the BBC version (its great, so mannered and stiff, slowly escalating to this apocalyptic pitch..)- is the hammer one substantially different? The Hammer one loses that mannered stiffness; Keir is excellent as Quatermass. The thing has more pace. The ending is also slightly different; Quatermass and his assistant just stand there in catatonic shock, silent - there's no rousing speech to conclude as in the TV version. >>> During the ensuing - Archaen - epoch the molten core was buried within a crustal shell, producing an insulated reservoir of primal exogeneous trauma, the geocosmic motor of terrestrial transmutation. The core as a protrusive xenochemical insider tries to induce a mass extinction to the earth’s body. Richard Muller suggests that the cryptogenic lighter components in the iron ocean of the outer core drift outward and cumulate beneath the solid mantle through topsy-turvy slopes with a very low degree of steepness. The molten iron heap eventually turns into an aggressive slope process as a result of overloading and form a bottom-up avalanche, as if the core trying to slither up the earth’s body in a katahuming motion. A large asteroid mass hitting the earth at an oblique angle could make the mantle tremor so fiercely that bottom-up avalanches of vast proportions take place; abruptly, diffusing agitation and disruption through the outer core, and consequently the external magnetic field ... reversing the planet’s polarity. The enthusiasm of the core to answer to the xenopulses is beyond limit. On the other hand, cthelllium is packed with schizoid anomalies: while the outer core is constituted of intensive flows, the inner core also maintains its own type of dynamism offbeat to the earth’s rotation, spinning significantly faster than the planet. The inner core appears to have a split personality, with one hemisphere different from the other. The question posed by this radical insurgency is that how such a rebellion came to populate its polytics inside the earth. More lateler ... in the massive update at cold me website (www.cold-me.net) in july. These "genetic memories" sound a bit more like Jung's collective unconscious to me. I doubt that there's a consensual hard science theory. Rupert Sheldrake's theory of morphopgenetic resonance is probably the closest stab. He still hasn't been disproven as far as I can remember. Oh and the usual caveat w.r.t. appeals to the authority of science -- the book ain't written yet. Whatever our current scientific model is, it will look laughably naive in a thousand years time. Scientists -- fans of scientism -- hate hearing this, but it's true. Their irritation is the mark of the juvenility of scientism's worldview. Gordon Rattray Taylor in his 20 year old book "The great evolution mystery" gives some examples of apparently Lamarckian transmission of "learned" characteristics - adaptations that contradict the strictly Darwinian model of characteristics derived from random genetic mutations being naturally selected by the trials of life. Many examples (for instance the development of complex organs like the human eye and ear) are given as evidence that the random mutation/natural selection (i.e. strictly Darwinian) model of evolution was insufficient and outdated, even in 1980 and in back to the beginning of the 20th century. Mr Rattray Taylor concludes that there must be other processes at work and speculates that the genes of all living things may have a more or less finite "repertoire" of latent potentialities for change that are activated by external stimuli. What these potentialities are, and where they come from is of course the great mystery of the book's title. Unfortunately I am not that widely read on the subject so I can't be very authoritative but it's clear that this theory opens up the question of evolution and the potential of living things. BTW The book also mentions how Darwin himself had many doubts about his own theories. Despite pooh-pooing Lamarck loudly Darwin apparently proposed thories in his time which were Lamrckian and therefore in contradiction to what we understand as "Darwinian" dogma. Thanks guys, this is exactly the kind of feedback I wanted and/ or needed. Mark S: yes, the notion of cultural memory vectors would square the circle, but this actually contradicts what happens in the film which, as Marcus said, maintains that human beings have _actual_ albeit repressed memories of the Martian genocide. Some of this reminds me of D and G 'On the Refrain' which I've just been puzzling my way through (again); they say animals have religion, never mind language!